Can Someone Really "Steal" Your Book Title? This brings up a great point. Isn't it plagiarizing to steal another author's title, especially if the first book was a success? Well...no. And that brings us to today's #pubtip: You can't copyright a book title. And once you spend some time thinking about it, you'll know that's obvious, because lots of books share the same titles! Sometimes it's titles that don't seem particularly original, e.g., the many romance novels called something like Forbidden Love." But sometimes this happens even with titles that feel as though they ought to be unique. I can only imagine how it felt to the authors (and their agents and editors) to discover that Mitchell's CLOUD ATLAS and Callanan's THE CLOUD ATLAS were both being published in 2004. That's a weird coincidence, right? Imagine harboring a phrase like "Cloud Atlas" in your heart for years and then...someone else has it too?! It's like planning to name your baby something unique and then seeing it on your sister-in-law's birth announcement. Title trends can include the pattern or structure of a title, like the examples I tweeted, as well as words. 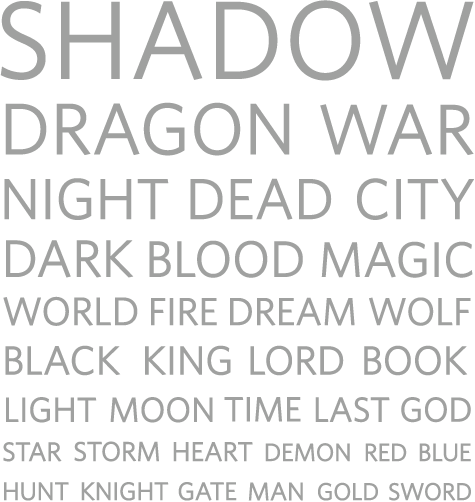 Fantasy publisher Tor.com did a statistical analysis of recent SFF titles and came up with a pretty fun word cloud showing which words were most popular. Check it out below, and click the image to see their analysis.